Whilst I was filming with the BBC Natural History Unit in the Bahamas and Florida, a leading shark biologist said something like “We’ve saved the gorilla from the King Kong image, helped the reputation of lions and tigers as not all being man-eaters, but the biggest challenge of all is the shark.” And that remains the case today, many years later. 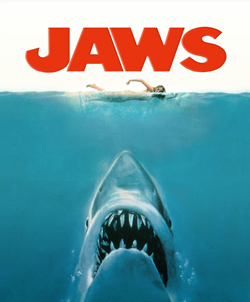 The famous movie Jaws and its’ endless sequels didn’t help of course. Author Peter Benchley was said to be surprised by the worldwide audience response. And greatly regretted he had done such a disservice to sharks. “We’ll need a bigger boat” will never be forgotten. Since then we’ve been reassured that the chances of being killed by a shark are the equivalent of being hit by a falling statue of Saddam Hussein, trampled by a Dodo, or run over by a drunken goldfish. Bad publicity has always been a problem for sharks. How can you hope to stop the cruel ‘finning’ of sharks for the greedy Chinese, with millions being killed every year for tasteless shark fin soup? How can you save a beautiful, ancient fish when it’s labelled so predictably? Why are the waters always “shark-infested”? Enter BBC Wildlife magazine August 2013. The front cover (which sells the magazine) has the usual big teeth… “BITE”, “fiercest predators clash”, typical words that go with the typical image. So it’s a surprise to find on page 39 the headline “Great whites in crisis”. 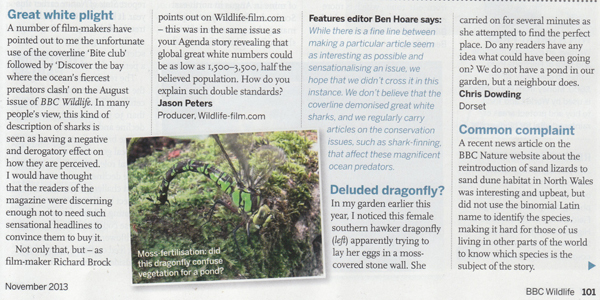 I have asked James Fair, Environment Editor of the magazine to explain these apparent double standards. I look forward to his reply. 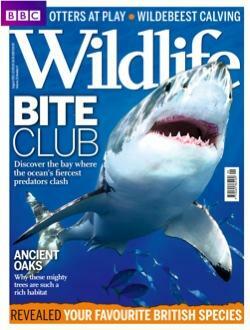 "I think it's a moot point as to whether the cover line 'Bite club: Discover the bay where the ocean's fiercest predators clash' has a negative and derogatory effect on the way people perceive sharks – there is certainly no suggestion, either within the cover line or the article itself, that they are any threat to humans. I know there are people – our columnist Richard Mabey has written about this – who feel that there is too great an emphasis, on both TV and in the printed media in general, on predation per se, but the fact is that people are fascinated by it. The success of Steve Backshall's Deadly 60 TV programmes illustrates this – see our October issue, just out for a new piece about this. In any case, BBC Wildlife has consistently run articles celebrating some of the world's most remarkable sharks and raising awareness about the threats they face. We were one of the first publications to run images of the extraordinary breaching behaviour of great white sharks, for example, and we were warning about the unsustainable scale of the shark-fin trade more than a decade ago – and have continued to do so. In his Wild Thoughts column, Mark Carwardine has brought to wider public attention the issue of the Chinese demand for wildlife 'products' (such as shark fins) and the problems caused by shark nets and raised the alarm over a plan to catch whale sharks for tourists to swim with. We have also run pieces about sharks in British waters, too. When there was a series of shark attacks on people in the Red Sea in 2010, we ran a balanced piece looking at what was really going on and why people didn't need to be afraid of sharks"
Also see these articles and film clip giving the opinions of member Chris Palmer on depiction of sharks in movies and Discovery Channel’s Shark Week. From Scientific American: Film Fakery: Does Shark Week Harm Conservation Efforts? Hollywood loves to portray sharks as evil, but in reality, it's not helping those in the wild.